Yesterday I posted about my experience on Win8 with TFS Express and error TF400533, and today I’m back to report that I found a solution that doesn’t involve waiting for an update. I also noticed at least one comment from someone else who’s run into the same error on Win7. I thought it might be helpful to describe how I worked around the problem on Win8 and offer some general guidance for people running into this on other platforms. First, I want to say that I can’t take credit for this idea. A reader wrote me last night, suggesting this neat trick: Uninstall the version of SQL Express 2012 on Win8, and then install TFS Express to get the latest version of SQL Express 2012 (instead of waiting for the patch to come out next month). It’s a great idea, and I’m ashamed I didn’t think of it myself. I’m sure it would have worked, but unfortunately my problems were a little more complicated. 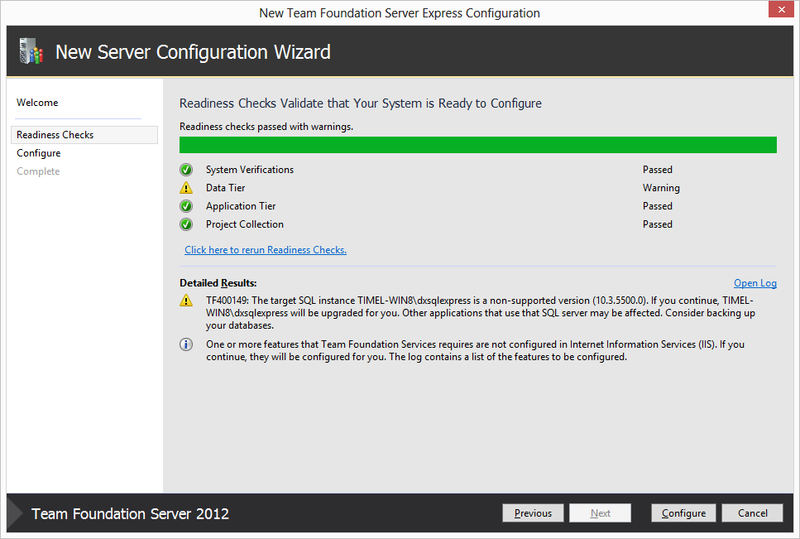 Turns out I had a older version of SQL Server Express on my Win8 machine for an internal tool that I use every day. But the good news is that once I uninstalled SQL Server Express 2012, Microsoft Update informed me that I could update the older version of SQL Server Express (pictured). And once I updated SQL Express, TFS Express installed, and updated the old version SQL Express to the version it needs (pictured) as expected. I must have been caught in some crazy loop where TFS wouldn’t install because I had an old SQL Express onboard, and Windows Update wouldn’t update me because I had the new SQL Express that comes with Win8 on board. Who knows? If you’re struggling to get past error TF400533 on Win8 or some other platform, I’d say try the steps at the bottom of this post, in the order they appear listed. Good luck and let me know how you make out in the comments! Check Microsoft Update. 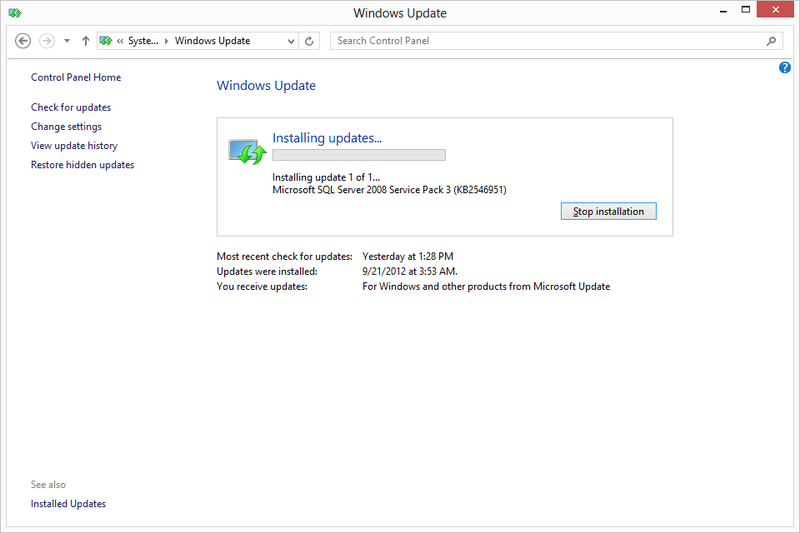 If you do get updates to install from either Windows Update or Microsoft Update, make sure to scan again, especially if you have been asked to reboot. Sometimes you have to reboot and scan multiple times to get all the updates available. Uninstall unused version of SQL Express. This can’t hurt, especially if you’re on Win8 and haven’t used SQL Express for anything. Be careful not to lose any important data. Consider using the new SQL Server data management tools to back up your data before you move it and then to restore it later. Manually install SQL Server Express with SP2. Get the download here. This option is the most complicated because the install doesn’t shield you from any of the complexities of the full SQL install. Fortunately I have a video that walks you through the SQL Server for TFS. If you have this version of SQL Express in place, the TFS Express installer will update you to the version of SQL Express it needs.